Football doesn’t needs any introduction, it is one of the most famous sport every played on earth. This game had taken giant leap when played by robot. 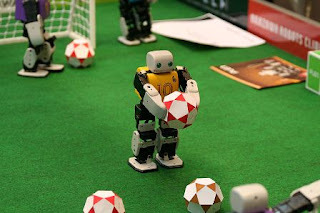 I have seen that in any robotic engineering competition, game of robots football is inevitable. Robot Football requires smart movable robots that need to act as a team in real time and adjust in a very dynamic environment to accomplish definite objectives.It is very complex topic, but I would try to share basics of this project with you. Artificial Intelligence: While playing football robot would face new challenges, you should have knowledge of AI to program it in such a way that it can take its own decisions according to the situation. Real time image processing: It is self explanatory, that why we need that. Autonomous systems: It’s up to you which type of robot you want to build, fully autonomous or computer controlled one. Mechatronics : It is a science involved with both Mechanical and Electronics. Without having knowledge of both you would not able to move forward with this project. It is extremely helpful in removing complexities, because without it, you would face hardware constraints and lose focus from your primary goal.MINDSTORMS kit includes NXT Brick, Microprocessors with Bluetooth, Servo Motors, Light, Touch, Sound and Distance sensors. LEGO MINDSTORMS NXT: It is a drag and drop software and developing programs with this new software is fun and easy. It comes with building instructions and programming guides to easily begin constructing and programming with MINDSTORMS NXT robots. Realterm: Realterm is a terminal program specially designed for capturing, controlling and debugging binary and other difficult data streams.